So, I may have been a bit misleading recently when I posted a couple of pictures of my cranium. 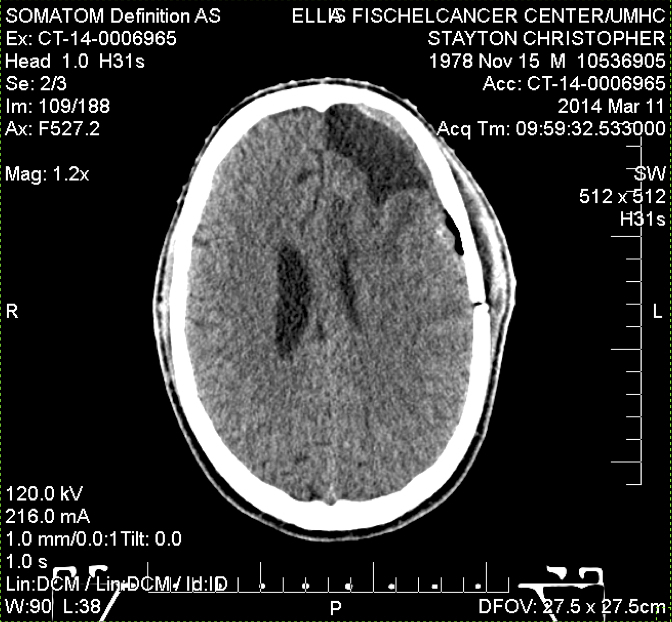 One was a pre-operative MRI with Bwian the Bwain Tumor in white. The next was a scan of Bwian eviction to illustrate how much of Mikey’s brain was removed thanks to siwwy wittew Bwian. Though they were definitely scans of my brain before and after surgery, the post-op was one day later. I used the second one because I’m a drama queen. Now I’ll let you compare it to how it looked two-weeks after surgery. 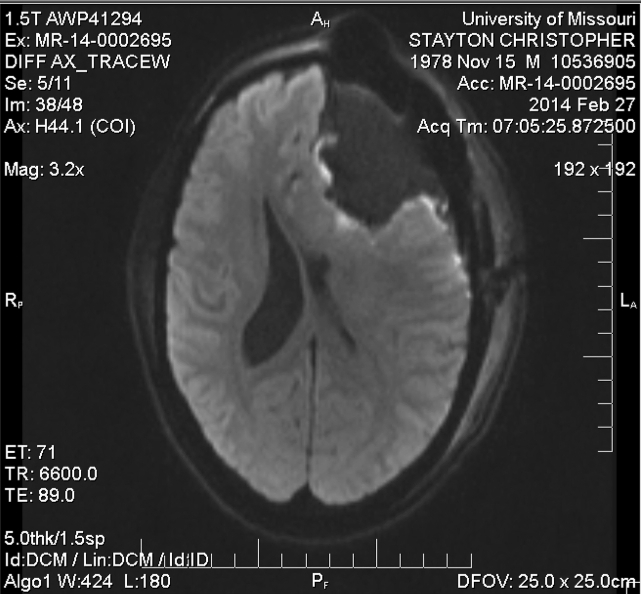 Today’s scan (below) is almost two weeks (March 11) from surgery and represents a more accurate gauge of how my brain is returning to my “new normal.” Post-operative swelling is subsiding and the tumor’s space is returned to its rightful owner. As a quick explanation of that last part, unlike other parts of the body where tumors can be externally visible, a tumor growing within the rigid structure such as the skull can only strong-arm its way into neighboring soft tissues (my brain). Removal of the tumor relieved the edema (intercranial compression due to excess pressure) from the surrounding areas and is allowing my noodle to return to its more “normal” size and shape. This pressure on my brain is what caused my symptoms. Look! I’m even getting that weird air pocket back that the doctors say is normal! Now if only brain cells grew back more easily. Whew. Okay. This makes me feel better. I was so worried about a ginormous hole in your brain.